A party bus in Phoenix, AZ is a specially equipped vehicle that has been customized to make mobile parties possible. Unlike limos and charter buses, a party bus is specifically designed to drive the passengers around an area and to essentially serve as a moving nightclub. But what are the party bus rules that you need to know in order to throw an unforgettable party onboard one? For instance, is drinking allowed on a party bus? Are there other things you can do on a party bus except eating and drinking? In this article, we’ll answer all these questions. Read on to learn more. How old do you have to be to get a party bus? While there are no strict regulations governing how old you have to be to enter a party bus, alcohol consumption laws are still in full effect. Therefore, a person younger than 21 is not allowed to drink alcoholic beverages anywhere, and that includes party buses. Some party bus rental companies regulate this by enforcing a strict legal-adults-only policy when it comes to who can enter their party buses. Others will only drive people 18-20 years of age if their destination is some place where people of that age are legally allowed to enter. Certain states place the burden of responsibility on party bus rental companies. In these states, if there are any people younger than 21 onboard the bus, the company is required to provide a chaperone who is at least 25 years of age. This person’s job is to prevent minors from consuming alcohol. Can you bring food on a party bus? Short answer: it depends. Long answer: there are some bus rental companies out there that expect their clients to consume only the alcohol and the food that has been supplied by the party bus service itself. These companies, however, are few and far between. In most cases, it’s actually advisable that you bring water and snacks with you, as bus rides can cause nausea in some people and having a readily available snack or a sip of water can relieve the discomfort. Comfy leather seats for extra relaxation. Powerhouse sound system, because a party isn’t really a party without great music. Myriad connectivity options such as Bluetooth, DVD, BluRay, CD, etc. Strobe and laser illumination to give it that awesome nightclub feel. Flat screen displays to watch music videos and movies. Illuminated bars equipped with coolers and as much booze as the coolers can carry. Is it legal to drink on a party bus in Arizona? As long as you’re a legal adult (21+ years old), you are allowed to drink alcohol onboard a party bus. In fact, getting tipsy on a party bus is a big part of the whole experience and is often the reason why people choose party buses over the more traditional transportation options. It goes without saying that under no circumstances is the chauffeur allowed to partake of the festivities. Always choose a reputable party bus rental company that has all the necessary documentation and carefully screens and background-checks its drivers to ensure maximum professionalism and trustworthiness. Finally, all passengers should make arrangements to arrive at the pick-up location in a manner that doesn’t require them to personally drive back home later. Party or no party, safety should always be the primary concern. Are you and your friends attending a huge birthday party at one of Downtown Phoenix nightclubs? Do you want to arrive in style? Maybe you’re organizing a bachelorette party and you need appropriate transportation for the occasion? Whatever your needs, AZ Limo is fully equipped to supply you with modern party buses that all but guarantee you and your friends will have a great time. Reach out to us today. 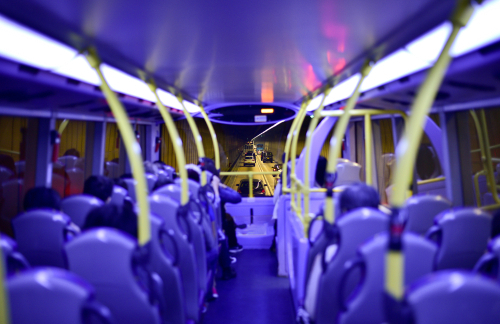 Renting a Coach Bus: How Much Does It Cost?